Homeseer just announced they are now offering a tabletop Android touch screen. Customized to run HSTouch upon boot-up, the unit seems to feature average specs, but it does look pretty nice and price isn't bad either ($149 with coupon TT-20). Manual is available here. OS: Android v4.04 "Ice Cream Sandwich"
CocoonTech visited HomeSeer Technologies during the CES show this year. HomeSeer has added new features to their HSTouch Mobile Application that includes automatic video camera support and (this is a big plus in my opinion) voice recognition via the Google voice engine on Android mobile hardware that can be used to trigger commands. This voice command option works really well! 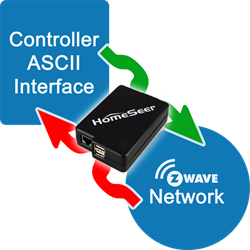 One only has to press the microphone icon on the bottom of the screen to initiate events via the HomeSeer automation software. Rich Helmke demonstrated this to me and amazingly, the recognition worked well in spite of all the horrendous background noise of the CES convention (and he didn't have to 'shout' the commands either)! This feature goes beyond simple commands as it can be used to customize events such as (as their press release states) "On Saturday, at 4:30 pm, turn the outside lights on for 3 hours"
They also have a 'canned' touch screen setup for mobile phone apps (for a quick 'out of the gate' setup) that can also be heavily customized by the user. Other new features include ease of setting up video cameras with their HSTouch (no more trying to figure out the obscure URL to get this to work with a mobile app). Presently their cameras only include the Foscam model, but other cameras should be added in the future. The mobile screens looked great during the presentation and will be a welcome addition to anyone using HSTouch (which is included with their new HomeTroller Zee device by the way). 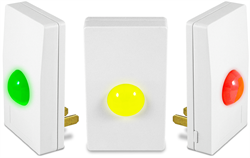 Black Friday Sale on HomeSeer Products! It looks like the first public beta of the next major release of Homeseer 3.0 has been announced, and is now available for download. Thanks WayneW! Keep in mind that this is still beta, so make sure you try this on a different system, or make a COMPLETE backup of your existing system so you can roll back. Check out this thread for more information about what's new (impressive list). Please use this thread for comments. HomeSeer Technologies just released a new version of their existing in-wall mountable HST-IWAR7 touch screen. Manual and photo file names have not changed, and neither has the look, so it looks like this is just a bump in specs. Major changes are the switch from a resistive to a capacitive touch screen, and a bump in CPU speed (from 800MHz to 1.2GHz). The OS is still Android Ice Cream Sandwich. New part number is HST-IWAC7, and can be purchased via the Homeseer Store.